Hydrocarbons and offshore chemicals are routinely discharged to the marine environment during offshore oil and gas operations. Assessment of the discharges and spills show that OSPAR measures have led to decreases in the discharges of both hydrocarbons and the most harmful offshore chemicals. The least harmful substances used in the industry are considered to Pose Little Or No Risk (PLONOR) to the marine environment. The most harmful chemicals in terms of toxicity, bioaccumulation and biodegradation are considered as candidates for substitution. The OSPAR Commission’s strategic objective for offshore oil and gas activities is to prevent and eliminate pollution and take the necessary measures to protect the OSPAR Maritime Area against the adverse effects of offshore activities. This is achieved through setting environmental goals and improving management mechanisms. Oil and chemicals also enter the marine environment through accidental spills. The OSPAR maritime area is a mature oil and gas production area. Total production has steadily declined over the period of the assessment. Figure 2 shows the downward trend in production. 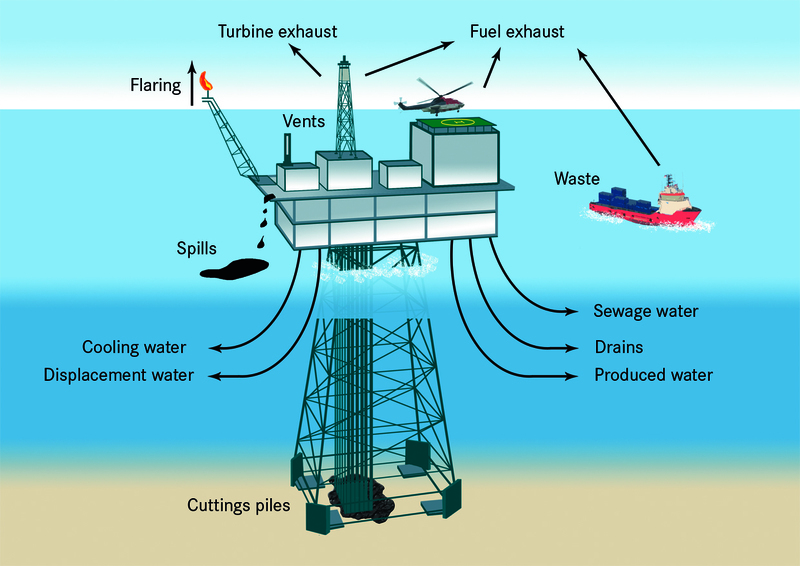 Chemical inputs to the marine environment from the offshore oil and gas industry vary depending on the activity being carried out. Discharges of hydrocarbons from offshore oil and gas installations are primarily from produced water, which contains both naturally occurring substances and added chemicals, some of which are categorised as hazardous substances (Figure 1). Hydrocarbons and chemicals are also discharged during the exploration phase, in the course of drilling operations, although the more harmful chemicals are not used whenever this is possible and are not discharged frequently. Routine operation of production platforms and drilling installations leads to the release of hydrocarbons and other chemicals to the sea, including naturally occurring substances, especially through discharges of produced water and during drilling operations. Accidental oil and chemical spills can also arise from different sources during routine operations. The main source of hydrocarbons discharged during routine production operations is produced water. This is the water that comes from the reservoir with the oil and gas. Produced water contains dispersed oil and hazardous substances that occur naturally in the reservoir, such as heavy metals, aromatic hydrocarbons, alkyl phenols and radionuclides. Following treatment on the installation, the produced water also contains residues of process chemicals, including corrosion inhibitors and emulsifiers. The OSPAR performance standard sets an upper limit of 30 mg l-1 for dispersed oil in produced water discharged to sea. Drilling requires the use of fluids that may contain a range of chemicals. These chemicals may be water-based or based on organic-phase fluids (e.g. lighter oil fractions and synthetic fluids). Drilling fluids are generally recycled, but as it also binds to rock fragments (cuttings) a proportion will be disposed to sea or returned to shore for treatment and disposal. Production operations also use chemicals to aid separation of oil, gas and produced water, to provide corrosion protection and to maintain the offshore process and utility plant. Some of these chemicals are discharged in the produced water. 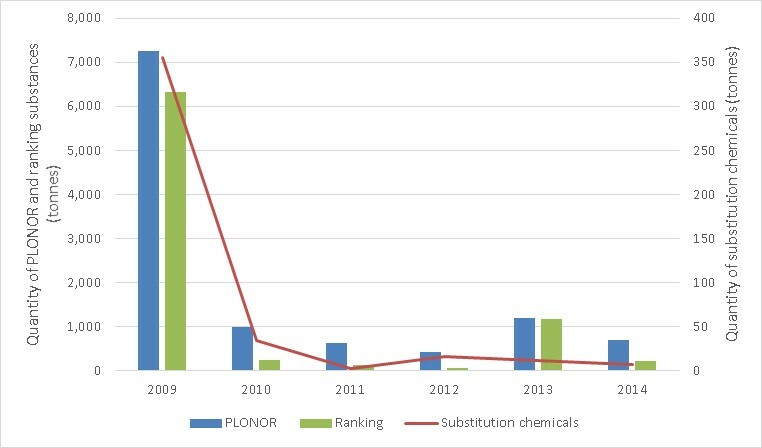 Chemicals used in exploration and production are categorised by OSPAR as PLONOR (Posing Little or No Risk to the environment), Substitution (those substances meeting the criteria set out in OSPAR Recommendation 2006/3) or as Ranking (neither PLONOR nor substitution). The OSPAR area is a mature oil and gas production area and total production of oil and gas in the OSPAR area has been steadily falling over the period of the assessment. Figure 2 shows the downward trend in production. Banning of dumping or leaving in place of disused offshore installations (subject to derogation in certain specified cases). To support the objectives of OSPAR’s Offshore Oil and Gas Industry Strategy, almost all offshore operators now follow OSPAR's promotion of environmental management systems for offshore installations and have adopted approved schemes. All Decisions, Recommendations and Agreements of relevance to this assessment are listed at the end of the document. This assessment sheet is based on the data collated in the Annual Reports prepared by the OSPAR’s Offshore Industry Committee (OIC) Expert Assessment Panel (EAP) on discharges, spills and emissions from offshore oil and gas installations. These data are available from the OSPAR website. The data used for the 2009 to 2014 assessment were from the 2013 OSPAR report on discharges, spills and emissions from offshore oil and gas installations (OSPAR report 2013) and the 2014 data agreed at the EAP meeting in January 2016 (shortly to be published on the OSPAR website). This assessment method used basic linear regression, best professional judgement and observation. There has been a 30% decrease in the use of chemicals carrying substitution warnings, and a 40% decrease in their discharge between 2009 and 2014. The OIC EAP examines and reports annually on discharge, spill and emission data. 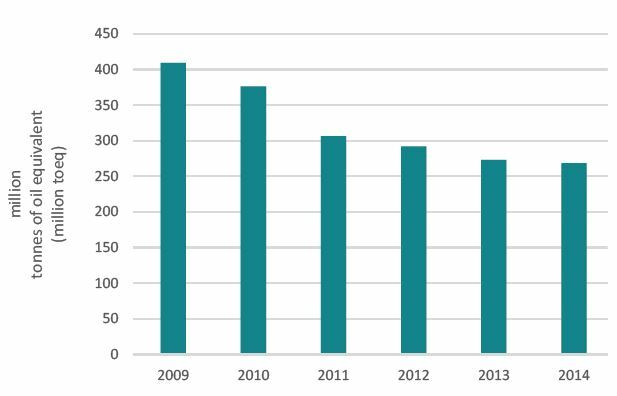 An assessment of data for the period 2009 – 2014 shows downward trends in the amount of dispersed oil discharged in produced water, use of chemicals on OSPAR’s List of Chemicals for Priority Action, and the use of chemicals carrying substitution warnings. In 2009, 4900 tonnes of dispersed oil were discharged in produced water. 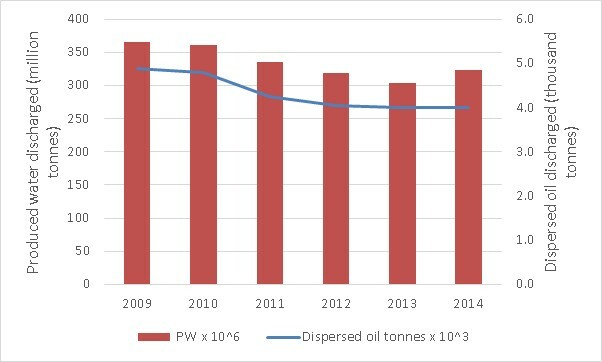 The amount of dispersed oil discharged in produced water has continued to decline despite a recent increase in produced water discharged (Figure 3). Figure 3. Quantity of produced water discharged and quantity of associated dispersed oil discharged to the OSPAR Maritime Area 2009 – 2014. (Note different scales on primary and secondary y axes). In 2009, more than 1200 tonnes of LCPA were used, and nearly 150 tonnes discharged. 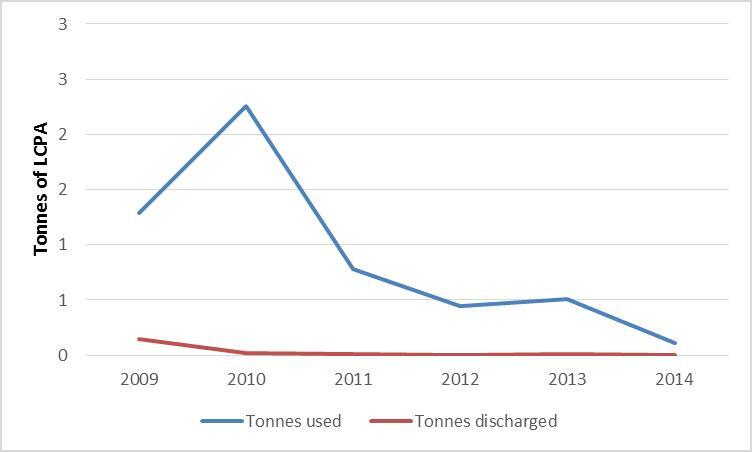 In 2014, just over 100 tonnes were used and none discharged (Figure 4). In 2009, more than 10 000 tonnes of substances identified as candidates for substitution were used, and 1735 tonnes discharged. 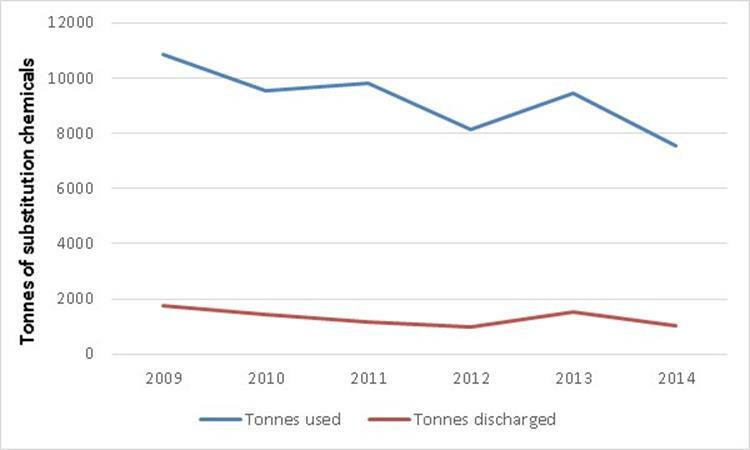 In 2014, just over 7500 tonnes were used with just over 1000 tonnes discharged (Figure 5). 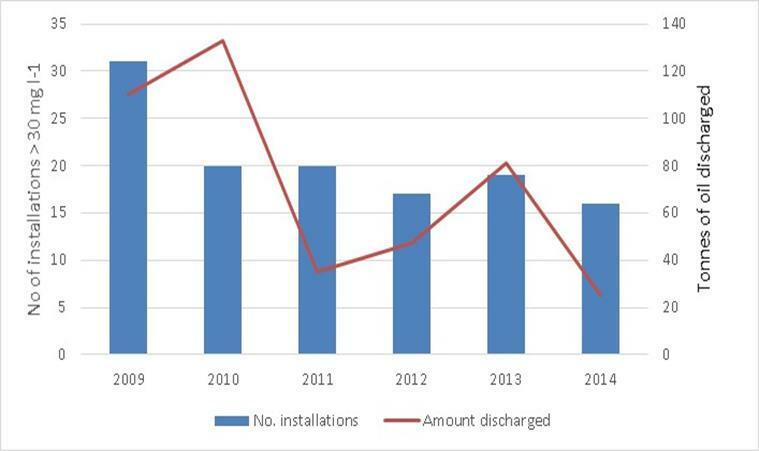 There was a 50% decrease (but no clear trend) in the number of installations exceeding the 30 mg l-1 dispersed oil in produced water performance standard between 2009 (31) and 2014 (16), and the amount of oil discharged in exceedance of the performance standard decreased by more than 70% over this period (see Figure 6). 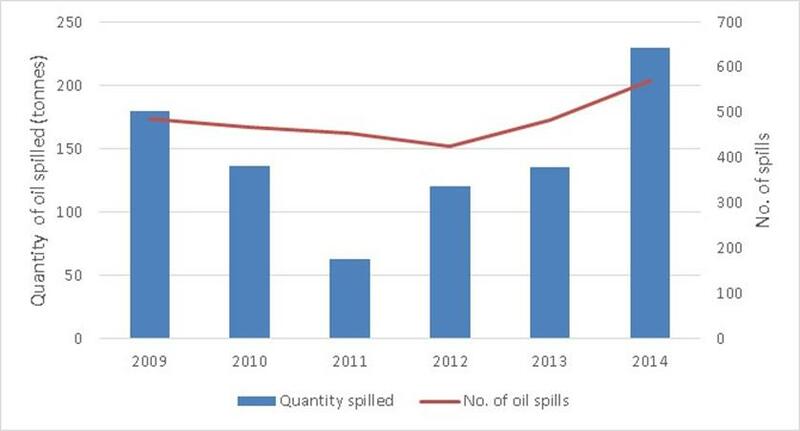 It was not possible to determine any positive or negative trends in the number of oil and chemical spills between 2009 and 2014 (Figure 7), or in the quantity of oil and chemicals spilled (Figure 8). It is evident that the majority of chemicals spilled are PLONOR chemicals. Incidents resulting in spills are extremely variable and a small number of large spills can adversely affect any attempts to assess trends. Use and discharge of chemicals carrying substitution warnings. The gradual reduction in dispersed oil discharged in produced water has been achieved through the application of standards set out in OSPAR Recommendation 2001/1 for the Management of Produced Water from Offshore Installations, as amended by OSPAR Recommendation 2006/4 and Recommendation 2011/8. The phasing out of LCPAs was achieved through the application of OSPAR Recommendation 2005/2 on Environmental Goals for the Discharge by the Offshore Industry of Chemicals that Are, or Contain Added Substances, Listed in the OSPAR 2004 List of Chemicals for Priority Action. Reductions in the use and discharge of substances carrying substitution warnings can be directly attributed to the implementation of OSPAR Recommendation 2006/3 on Environmental Goals for the Discharge by the Offshore Industry of Chemicals that Are, or Which Contain Substances Identified as Candidates for Substitution. A decrease in the number of installations exceeding 30 mg l-1 oil for dispersed oil in produced water discharged to sea was noted, though a clear trend is not apparent. Many of the downward trends have clearly been achieved as the direct result of measures adopted by OSPAR and their subsequent implementation by the offshore oil and gas industry. It was not possible to determine any positive or negative trends in the number of oil and chemical spills, or in the quantity of oil and chemicals spilled, due to the unpredictable nature of such events. The OIC EAP examined and assessed data reported on discharges, spills and emissions, from 2009 to 2014 for this assessment. Several trends were identified. The gradual reduction in dispersed oil discharged in produced water has been achieved through the application of standards detailed in OSPAR Recommendation 2001/1 for the Management of Produced Water from Offshore Installations, as amended by OSPAR Recommendation 2006/4 and Recommendation 2011/8. Although a trend was not discernible, the observed improvement in the number of installations exceeding the OSPAR performance standard of 30 mg l-1 oil for dispersed oil in produced water discharged to sea over the period of the assessment may be partly attributed to efforts made through annual reporting, where Operators are obliged to report reasons for exceedance and action being taken to prevent future exceedances. It was not possible to determine any positive or negative trends in the number of oil and chemical spills, or in the quantity of oil and chemicals spilled. In 2012, OSPAR adopted Recommendation 2012/5 for a Risk-Based Approach to the Management of Produced Water Discharges from Offshore Installations. However, the risk based approach has not been in operation long enough to indicate whether it is having an impact on the quality of the marine environment. This gap will be addressed as more information becomes available. 3. OSPAR Decision 2000/2 on a Harmonised Mandatory Control System for the Use and Reduction of the Discharge of Offshore Chemicals. Amended by Decision 2005/1. 5. OSPAR Recommendation 2001/1 for the Management of Produced Water from Offshore Installations. Amended by OSPAR Recommendation 2006/4 and Recommendation 2011/8. 9. OSPAR Recommendation 2006/3 on Environmental Goals for the Discharge by the Offshore Industry of Chemicals that Are, or Which Contain Substances Identified as Candidates for Substitution. 10. OSPAR Recommendation 2006/4 Amending OSPAR Recommendation 2001/1 on the Management of Produced Water. 2004-11	OSPAR Guidelines for Monitoring the Environmental Impact of Offshore Oil and Gas Activities. 2006-06	Oil in produced water analysis. Guideline on criteria for alternative methods acceptance and general guidelines on sample taking and handling.